Daffodilia chews on a mushroom as she gathers an inkwell and some parchment. She then sets down lightly on a chair by a table with a candle burning in a candle holder with a bit of tarnish not caught after the last cleaning pushed near the edge farthest from the chair. The flame atop the candle valiantly attempts to stay upright against a draft. She looks at a pile of mail at her right elbow and sighs gently as she picks out a particularly urgent note from Gammy Luckyfoot, and sets it upright against the candle holder before beginning to write. I know that you are busy helping the Dwarf folk beyond, and I have been catching up reading your posts now that I have again escaped the clutches of a sticky cellar door. (I really must ask the Housing Authority to assign a cellar door inspector.) I am sorry to hear you had to give up a warm bed soon after gaining one, but I am sure one awaits you in the future if you have not managed to find one since writing. Take heart. I admit to being a bit confused as to the order of some plans, despite many rereadings. My confusion brings me to this note. Gammy has been trying to update folks on the happenings in Moria, but is not certain if some from your group will be taking Holly Day respite on Saturday the 22nd or not. I did tell her that to the best of my knowledge, on Yule, there might be some folk from Alphred's group gathering at the 21st Hall for their own matters, but I am not certain for yours the Saturday before. Although I know this pidgeon may reach you too late to respond in a timely fashion, I write anyway in the hope that it will not. It may also be that by the time this reaches you, the Dwarves will have completed the repairs to the Waterworks, and this note may find you back in the 21st Hall with the comfort of dry beds. If you have had the good fortune to cross paths with Alphred and know more of what he plans on Yule, that would be grand to know as well. Please advise me of what to tell her if it's not too late, and I will pass it along as soon as I read it. If supplies are needed, do let me know so we can gather them and get them on the next cart heading east. I hope to be taking stock of our stores over the weekend. Would any firestarter kits be of assistance, or is it too damp for such, I wonder. P.S. Oh, and though I don't think it wise to swim in waters edged with bodies, maybe if the water smells fine, it's okies. It is so good to hear from you. I hope all is well in the Shire. I've been away for quite some time. I suspect the Yule festivities are in full swing now. Down here in this mine it is easy to lose track of time. One day blurs into the next - I have no idea iffen it is day or night. I am awake . . . that is all I know. I am sorry my reports have been confusing and I shall endeavor to be clearer in the future. Anyways, the dwarfs here are also celebrating the yule season so we're not intending any serious adventuring. We are in a place called the Water Works - where there is a lot of water coming from the walls turning big wheels running fans and mills and hammers and all sorts of machinery. Except, some of them are gummed up a bit, and we are trying to help the dwarfs fix them. Things are slimey and such. We're making acids out of bug parts and using them to clean things a bit. Iffen you would like to know, I will enclose a list of our plans for the next couple of weeks so as you can see what types of affairs we are about. Some day, I hope, I will see the Shire again. But not this day. Or any day soon, I fear. Take care of the Shire while I'm gone. Dec. 22, 9:00 AM Club Eclair (Lvl 51) will be patrolling about the Water Works in Moria finishing up chores that are to be done here - mostly working on the big wheel. Still, we will likely finish in the Water Works and decide at the end to pack up and return to the 21st Hall. Dec. 24, 8:30 PM Club Eclair (Lvl 51) ((Christmas Eve)) Also patrolling about the Water Works - iffen there is anybody about to do so. The dwarfs are planning big celebrations for tonight and I am expecting there will be few people available for a patrol. It will be light duties. Dec. 29: 9:00 AM Club Eclair (Lvl 51) We'll be at the 21st Hall. We'll putter about a bit and enjoy the celebrations. Nothing too stressful. Dec. 30: 10:00 AM Rift Run, Tier II (Lvl 51 and below). Mostly run by Eclairians but we're inviting folks with characters level 51 and below to join in an adventure to try The Rift Tier II. It'll involve Club Eclair characters, but it'll be OOC because of the time required. Just an interest in trying it out. Dec. 31: 8:30 PM: Club Eclair (Lvl 51) ((New Years' Eve)) The Monday group has likely fallen behind a bit so it will still likely be wandering about the Water Works completing chores for the dwarfs. It will intend to be done with the Water Works when it retires for the evening and will be at the 21st Hall the following week. Jan. 2: 8:30 PM Rift Run, Tier II (Lvl 51 and below). Mostly run by Eclairians but we're inviting folks with characters level 51 and below to join in an adventure to try The Rift Tier II. It'll involve Club Eclair characters, but it'll be OOC because of the time required. Just an interest in trying it out. Daffodilia hears a pigeon tapping at the windowsill, and rushes over to open the window. She carefully takes the note it carries, then spreads a bit of seed on the sill for the pigeon before closing the window. She turns from the window, and opens the note just long enough to confirm the handwriting before heading out of the room. As she enters the foyer of the Addernotch Stationhouse, she pulls her hat on firmly before trotting out the door, heading towards the Luckyfoots' home. As I feared, I have ended up with some dread disease. I have been laying here in the midst of the Water Works brought low by fever and chills whilst others do their adventuring without me. Twice now, my companions have gone off on patrols without me, while I am scarce able to sit up. That has to end. We are planning one last patrol of these Water Works, and I shall go with them - then we will be off for the 21st Hall. Indeed, some of us have already left. I heard Sagla making plans to return to the 21st Hall and Hedgerow is packing his gear as well - claiming that all that is left here to do is another patrol or two to take care of the orcs and spiders. I am going to force myself out of this bed to go with them no matter how poorly I feel. I have duties to attend to. We'll make one last patrol to take care of spiders and fungus orcs and, mayhaps, clean up another of their great water wheels before we, too, will take the march to the 21st hall for a well earned celebration. Besides, it'll do me good to be out of this place. I like the fishing, mind you. And when I am feeling better I sit on a small bridge with a dwarf friend I have made here and we fish the channel flowing through this room. It is peculiar, father . . . there is a strange illusion in the water. It seems to be no more than ankle deep, but it is in fact deep enough to haul out some quite large fish. It may take me a bit to get my strength back - but I am with a good crew and we have already done a great deal of work in these parts, so there should be nothing to worry about from the patrol, even if I will not be at my best. We do have some fearful news, I am afraid. You may recall my mentioning that there was this great beast that blocked the door to Moria until it was bested in a major battle. The dwarfs gave us special weapons from a bygone age to learn to use so as we could help in the battle. Though, as it turned out, we were off on a patrol to Edenwaith looking for one of these mysterious relics when the dwarfs got their nerve up to launch their attack. Only Erikin amongst us was nearby to help in the battle. They did not slay the beast - which had killed a great many dwarfs. They only drove it off. Well, we now know where they drove it off to. There's signs of it around here. 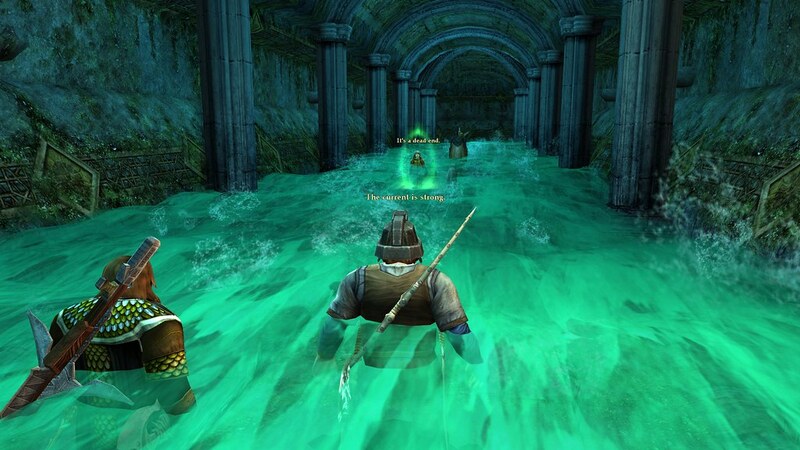 We've heard the orcs complaining about tentacles rising out of the water to pull them in. The beast has a lair down here. Yet, we are leaving. I am thinking that some among us are hoping that the beast will keep to itself in its corner of the Water Works and not bother the dwarfs - and so the dwarfs will have no call to bother it. It is not like before, where the beast blocked the very entrance to Moria. Here, it is mostly out of the way, or so I hear. Except I heard mention among the dwarfs that some of the mechanics for operating the gears and wheels that power Moria are to be found in the flood chamber that the beast now calls its home. So, I fear, it may have to be driven off yet again. I have no doubt that they will call upon us iffen that is needed. In my illness, even writing this post takes more than I can spend in my condition. Therefore, I will sign off now and return to my bed. Mayhaps, when I wake, I will be able to get to my feet and do something constructive again. I so much prefer to do something constructive. Jan. 5, 7. We're starting the new year with a new adventure - starting with the Zelem Melek quest chain. Special sessions: Dec. 30, 10:00 AM; Jan. 2, 8:30 PM: We will muster for a story telling of the Battle of The Rift. Actually, the plan is to try out The Rift Tier II with a level cap of 51 (52). If this goes well, we may arrange for a time to try out Tier III. (1) Complete the Zelem Melek quest chain. (2) March to Orcwatch - a long and bloody walk that will trigger about 20 automatically bestowed landscape quests (4 each in 5 regions) that we will investigate as we move along. (3) Raise the level cap to 53 and adventure through the Redhorn Lodes. (4) Raise the level cap to 55 and start the Grand Stair instance. I am writing to you from the peace and security of the Twenty-First Hall in Moria. I have been enjoying walking about without being all bundled up in weapons and armours waiting to get eaten by something. I have had a bath and am warm and dry, sitting by the fire, with a plate of bread and cheese and a pint of ale. Dwarfs serve their ales in pints, you know. Perhaps I ought not to mention that. There’s a sense of celebration about, and the Foredwarf Mogr has allowed even the workers and guards to relax a bit and share in the celebrations. I helped in the passing out of the ales myself. The Eclairians are straggling in from the Water Works, which we left after clearing it out of frogs, salamanders, fungus orcs, and crystal spiders. Indeed, just yesterday, while I was about taking care of chores and provisions and preparing a shipment of materials for Mr. Sweetweed, I saw Medloth coming in with Bohalin and Alphred not far behind. They did look tired and worn and I am wondering if I was such a sight when I returned to the Twenty-First Hall. No matter. I am certain that with some rest, a bath, some clean clothes, and a good night’s sleep in a real bed, and they will be as refreshed and fine as I am. 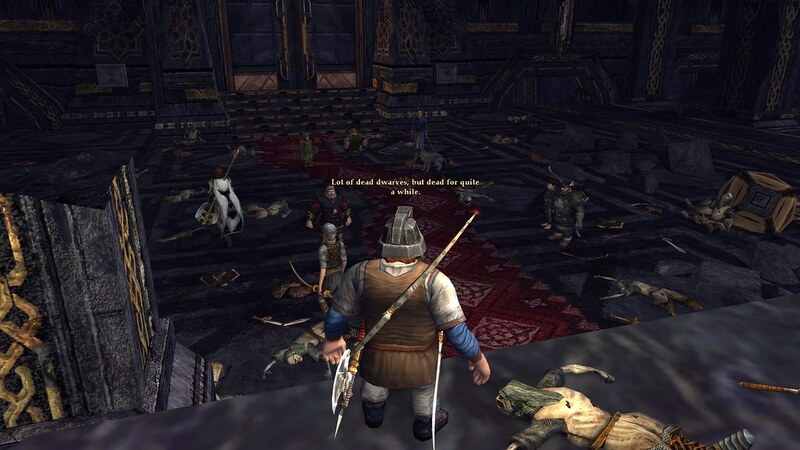 I have to seriously report that we have not come across any real problems here in helping the Dwarfs reclaim Moria. There have been a few small goblin and orc camps to chase back into the corners, but nothing that we could not handle without really much serious risk. The only exception has been some vaults off near the Deep Descent which the more powerul orcs had claimed as their own – as is understandable among orcs. If there were any powerful orcs about – those must have been it. We cleaned them out of all 20 of the vaults over the course of a few weeks. Since then we’ve done little more than squash bugs and hunt frogs. Seriously, I have just returned from a nice walk about, visiting with the dwarfs, going to the shops where I worked on my armours and weapons – repairing them and tending to them after so much time away – and getting my shipments sent out. I did not even have my dwarf club nor my shield with me . . . walking about as I would have walked about Michel Delving before I got caught up in this quest. The last few days have been quite welcome. Indeed, we sat about a warm fire just recently and told stories of our long ago adventures. We told stories of our battle against the chief of the Giants at Helegrod – though I do not quite recall the battle going the way it did in our telling. We also visited The Rift, but we scarce had enough people about to make it a worthy telling. Sagla, Roy, me, Erikin, and Medloth all turned out for the telling, but it left us with not enough audience participation to keep the story interesting, so we put it to bed. Sagla, Medloth and I reminisced about our visits to the Library and School at Tham Miridin instead. I have to confess that not everybody here thinks that things are going as well as they seem to me to be going. The Foredwarf Mogr has asked us Eclairians to go out on a patrol about the Twenty-First Hall. Honestly, we were so tired that we told Mogr that the patrol can wait. When we wake up next we will likely muster and make the patrol, but it will be after a good night’s sleep to be certain. I am expecting it to be a somewhat lazy patrol for, as I said, we have yet to find much in the way of serious danger about. But, it’ll put the dwarfs’ minds at ease and that will be a kindness. Mayhaps I will be coming home soon and leaving Moria to the dwarfs. I mean, I came here to help them as they helped us out when the Witch King of Angmar was a threat to the Shire. My help may not be so much needed as we once thought. Of course I would stay and help iffen they needed me . . . that is the proper and neighborly thing to do. But I do not think they would suffer any iffen I was back in my home in Michel Delving, having my suppers at the Bird and Baby and chatting with my neighbors over the hedgerow fence. I will let you know what plans I come up with after the patrol is done. But, as I said, I expect we will find nothing of significance at which time packing and returning to the Shire seems a real possibility. In a way, we are starting a new story. We have helped the Dwarfs claim the Great Delving, Silvertine Lodes, Durin’s Way, and the Water Works. Those regions are behind us . . . for the most part. What will start as a simple patrol where we will find some signs of things to worry about will result in a great deal of battling through the six Moria instances. We will then pick up the epic story line again and follow it out the eastern gate into Lothlorien. Jan. 5, 7: Folks should be refreshed from a few days off at the Twenty-First Hall recovering and resting and tending to one’s wounds and equipment. We will muster at Mogr at the Twenty-First Hall to take a quest “A Wide, Empty Hall” to patrol about the Twenty-First Hall to assure Reinn that everything is fine and there is nothing to worry about. We’ll make the patrol, then follow the quest chain into Zelem Melek. I originally thought we should try to finish this chain in a day, but I fear we may be moving a bit too quickly (as some have said so) so, if this takes a couple of sessions, so be it. Jan. 19, 21: My research suggests that, on this day, we will have two quests – a vector quest to Orc-Watch and a quest to explore “the Wide Halls” of Zelem-Melek, which are between the Twenty-First Hall and Orc-Watch. So, we’ll spend this day going to Orc-Watch. We will be under instructions to rid Zelem Melek of orcs, chasing them out of every distant corner, so this will be a long and somewhat bloody march. It will end with us at Orc-Watch and beginning our adventures in the Redhorn Lodes. Last edited by Tiempko; Jan 02 2019 at 11:48 AM. we have reached the Twenty-first Hall. It was not far from Jazargund and something to behold. A vast room, with rows and rows of tall columns to stabilize the roof and many dwarves were already there and buzzing about. This is the center of the Moria expedition! There must be close to 100 dwarves here and they have been busy. 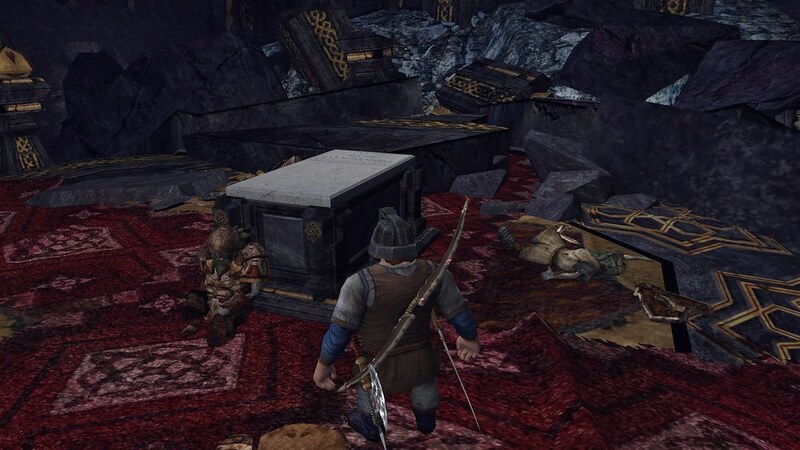 Crates and boxes everywhere, provisioners, goats, shops where you can sell ore and fur and other things you found and buy everything you need, armor, helmets, boots and all sorts of weapons. Guards were patrolling on wooden walkways above the ground and banners were raised. There is even a vault here and forges and smiths what mend your weapons or improve them. Very impressive. They have surely put in a lot of work and enthusiasm in the short time they have been here. The guards seemingly had some information we don't have, as many of them were talking about an orc named Mazog, who has proclaimed himself the new King of Moria. His orcs are supposed to be numerous, but they also seem to be not allied but rather fighting against other orcs from Mordor or those under the banner of the White Hand. That is pretty handy. We looked around for Brogur and found him in the so-called Chamber of Leadership, from where he said he will direct the reclamation of Khazad-dûm. It actually looked more like a mess hall, with lots of tables full of food. Mostly pumpkins though. It also had a lot of nice bunk beds. Brogur seemed genuinely happy to see us, at least as happy as a grumpy old dwarf with a lot of responsibility on his shoulders and who had recently lost his son could be. He had work for us and sent us out to look for two missing dwarves and while doing that, we found another great hall, the Hall of Durin. Marvelous place, with lots of small bridges and stairs and yellow and blue crystals to light the way and very richly decorated. From Hedge's estimation, it must sit right at the center of Khazad-dûm and passages lead to the north where the Twenty-first Hall is, west towards the Great Delving, east and south. Or down. The stone used there and in the adjacent corridors is quite different from the other places we've been. While on the upper levels it was mosty grey granite, this here was all carved out of black marble, a bit dull in places and in need of polishing, but still marvelous. In a rather big side chamber another group of orcs had set up camp. Blasphemy! We found the missing dwarves and kicked some orc behinds. We then went over to help Warr clear a room he and his team of workers had stumbled upon near the Twenty-first Hall. Warr was the dwarf who led the excavation of the door leading into Moria and he was also with us when the monster from the lake attacked. He thinks this chamber is important and who am I to doubt Warr. The chamber was mosty destroyed as the ceiling had collapsed and the floor was littered with rubble and debris, but not only that. There were broken shields, and rusted axes and swords and arrows lying about. And corpses, a lot of corpses. Some were decayed to a point where only the skeletons were left, both dwarves and orcs. But there were also orcs what could not have been dead for too long. Odd, very odd. Hedge concluded that there must have been two battles what were fought here, one quite a while ago where a lot of dwarves were killed and one fairly recent where a lot of orcs and goblins were killed. Very odd indeed. The Iron Garrison doesn't know who killed these orcs, so it must have been someone else. But who? Some of the arrows looked like they were made by elves. Did they come in from the other side? Are they still somewhere in Moria? Did they slay the monster what lies outside at the top of the mountain? And does Moria feel so relatively "safe" because that foe was slain? Maybe if we find them, we can work together to throw the remaining orcs out of Khazad-dûm. Brogur asked us to bring the book to his cousin Bosi, who was still at the Chamber of the Crossroads, and Hedge volunteered to do that. Said he learned about a safe passage to get there, through a long, winding and empty tunnel. I didn't want him to go alone however, so Galdhron and I accompanied him. You never know what may lurk in the shadows, right? The tunnel was safe enough though, only a few rats and crickets, but on the way we found two dwarves in front of a door to a library and helped them clean it out from the vermin inside. We got to the chamber without any incident and Hedge gave the book he had carried to Bosi. Bosi turned a couple of pages and sighed, looking very sad. Said he needs time to study the book in depth, I think he wants to learn from it so that this expedition will not meet the same fate as Balin's did. Sent us away to find yet another dwarf who'd gone out to hunt goblins all by himself. He mentioned the Water-works, and that was how we ended up there. We are going away again. The dwarfs here are asking us to patrol a section of hallway nearby. This hallway sits upon a path from here to a Dolven View. The fact that it isn’t being used – that travelers use the safer winding path to the north – tells us something about what to expect. Orc marauders have kept the path closed. I suppose we are to try to open it by forcing our way through. Though we’re really being asked to do a bit more than that and turn south to another outpost called Orc-Watch. We were thinking that the area about these parts was getting relatively safe and, in fact, some folks were thinking there’s no need for an army about and were talking about going back to the Shire. Many dwarfs have met an untimely end, but most of them had wandered out by themselves and gotten themselves ambushed. The dwarfs simply needed to have more hobbit sense - particularly when it comes to tickling danger. We were asked to go about a patrol around the Twenty-First Hall to find out iffen there were any real signs of troubles. We split up into two groups. I went with Medloth the bear-lady, Thorcundo, Bohalin, and Granleif. Hedgerow went out on patrol with Roy, Erikin, Bohunc, and . . . Tubli (I think). I know I have seen Tubli about, but don’t recall if he was on the patrol. We were none of us expecting to find anything. Truth be told, when it comes to walking among the dwarfs of the Twenty-First Hall, I was accustomed to leaving my weapons and shield in the room rather than lugging them about. Sagla was resting – likely thinking like the rest of us that we weren’t going to be finding anything particularly bothersome on the patrol. I’ve also got some worries about Amio. Amio has been good company. I suddenly recalled that I had not seen him about and now I have my fears that we may have left him at the Water Works. Gad, I feel bad about that. I am worried about what to do about it, and it kept me up all night. I do hope he’s safe and we hear from him soon. Mayhaps, while everybody else is getting ready for our next patrol, I would go look for him. Anyways, as to our patrol, we found some light chores to do . . . some of the lanterns had been blown out by wind and there was rubble laying about from a ceiling in need of repair. But we were shocked when we discovered a flock of arrows on the east side of the room. What is particularly shocking is that the entrance to the east side is blocked – caved in long ago. The only three ways into the Twenty-First Hall is, first, the Winding Path to the west – known to be safe; second, past the Chamber of Mazarbu and the Dwarf outpost of Jazârgund – so it is unlikely the orcs came from that direction. The third way is from south – from the Hall of Durin. We had patrolled there earlier and we had seen orcs, but for them to have infiltrated the Hall made us all a bit nervous. Gad, they had to walk right past the door to the Chamber of Leadership where we have been staying. Mogr the Foredwarf of the Twenty-First Hall, sent us on a patrol into the Hall of Durin with a rather nervous dwarf name of Reinn. He had been warning that there is trouble about and, once we saw that orcs had infiltrated the Hall, his worries seemed confirmed. At least, Mogr was convinced that further investigations were in order. So, we took Reinn with us and went to take another look at the Hall of Durin. This is truly an amazing place. It is the finest place in all of Moria, carved of black marble from floor to roof with intricate designs and carvings all about. The years (and the orcs) seem to have done no harm to it at all. You can see the grandness of the days of old in this chamber. We came upon another dwarf what has been watching over the area - that dwarf by the name of Domarr. I’ve mentioned before that too many of these dwarfs are travelling alone. Domarr was hiding from the orcs patrolling from a camp not far at all from where we found him. He took us on a scouting meeting where he showed us the camp. Well, Reinn figured he had all the evidence he needed and rushed off to tell Mogr that he was right all along. Meanwhile, me and the other Eclairians made plans to launch an attack on the camp and weaken it before them orcs decided to do some real harm to the dwarfs in the Hall. Our attack went well. Granleif estimated that we had slayed 20 orcs, but I am putting the count at nearer 50. They weren’t at all prepared for us, so we were able to move through quickly before they could even get themselves organized. We cut our way through, burning their temples and altars and slaying, I would estimate, mayhaps a dozen of their captains and leaders. Then we left before those who remained could get themselves organized into a counter-attack. Unfortunately, things did not go so well for Reinn. When we returned to the Twenty-First Hall to report to Mogr, he said he had not seen Reinn. We immediately rushed back to look for him, only to discover his body in the hallway. Orcs had slayed him. This upset us greatly. In these battles, we have known the deaths of a lot of folks. Laerden, Narmeleth, Lorniel, and others. I can’t say why, but the death of Reinn struck us as particularly hard. We’re anxious to teach the orcs a lesson now – as we will be doing when we aim to clear them out of Zelem Melek and claim them wide halls for the dwarfs. Don’t worry, father, I do not intend to get careless. I do not intend to give the orcs the comfort of getting rid of one of their enemies so easily. As always, I will have good company. I will next write to you from Orc-Watch, but you can continue to send your posts here to the Twenty-First Hall. The dwarfs will know how to find me. First and foremost, I have some concerns about the pace of things. The delicate balance of not going too slow for the fast folks and not going too fast for the slow folks constantly plagues me. Iffen somebody seems lost, you can direct them here to figure out what we’re doing. We did get through the Reinn/Domarr quest chain this week, so we will be moving to Orc-Watch in the week ahead. This march will result in about 20 landscape quests popping up as we travel, and about 5 orc camps that we will need to “investigate”. I am not expecting anything particularly difficult. But there will be a lot of battling. Ranged folks . . . please be kind to the close-combat folks and don’t go slaying all of the villains off at a distance. There will be plenty of orcs to go around. Once we start the Grand Stair then that, like the Forgotten Treasury, will keep us locked in one location for a few weeks. This will give people opportunities to do individual tasks between our group battles – if folks need catching up. This means that we are on the cusp of a level cap increase. It will be happening soon. Last edited by Tiempko; Jan 08 2019 at 12:19 PM. Unfortunately lost power and then Internet this past Monday. Couldn't get back on until 10:30 server time. I'll try to catch up and see you this coming Monday. I hope other Eclairians feel about such things as I do. But, in our last Saturday session . . . we went out on a patrol and got lost. We got caught in an area we could not get out of and ended up “missing” much of what I, at least, had intended to do. But, I like getting lost. Adventurers sometimes get lost. That’s one of the problems they have to deal with. Anyway, as a result of getting lost, we are going to have to backtrack a bit next time and pick up what we missed. I would like to offer my congratulations to the Bounders at Addernotch Station, ma’am. I realize on my calendar that you would have been having your eleventh birthday during the past week. I wish that I could have been there to help you celebrate, but it is an awful long way from the Shire. I know that I mentioned in my last post that things seem tamed here and that I may even be returning to the Shire in the near future. You might have even expected me to come walking up the path for the Bounder Birthday. However, it turns out that things here are not as tame as I had thought. Indeed, we have lost a fine dwarf named of Reinn who got himself ambush by a couple of large, mean orcs. And there’s a part of the part of Moria that seems filled with them. We’ve gotten reports of a whole lot of orcs in a region called Zelem-Melek. Whatever that means in Dwarf, I have no idea. The west hand is near the Twentyfirst Hall, where we have made our headquarters. There’s a few orc patrols and such in that area, but not so many as is that much of a bother or concern. Except, some seem to have gotten into the Hall recently . . . some orc arrows were found nearby what showed up within a day of us finding them. That was worrysome. But the real concern is the large army of orcs what seem to live between here and an outpost named of Orc-Watch. At first I was worried that we would not have much of a squad for battling. Roy, Bohunc, and I were all that mustered. I think the others were enjoying their rest. But, soon, along came Sagla and Erikin. Thorfaniel showed up, as did Galdhron. Our goal was to go out on a patrol and clear the road between here and Orc-Watch. We found one of the Orc camps and we went through and cleaned it out proper, chasing the orcs away and destroying or plundering anything they left behind. It involved more destroying than plundering, I assure you. We destroyed barricades, tents, and some odd totems they had placed about for some purpose. Not to mention ridding the camp of all orcs. I’m afraid that it was not the kind of work one would discuss around young hobbits. We attacked the orc camp with the full of our force and largely destroyed everything in it . . . and then we left. This camp was actually a fair ways off the trails, so we needed to find our way back along the main path. Only, we never got there. We took a wrong turn somewhere and ended up in this cavern. It looks like it was once carved by a large, underground river. Though it was dry now. Actually, I think I know exactly where we went wrong. When we got to the bridge what went off to Dolven View, we should have gone east. But we saw this fire lit to the south and went to investigate it instead. That fire was at the edge of this wild tunnel, and so we got pulled into going that direction and leaving the proper path far behind. By the time we got there, whomever had built it had abandoned it. Prob’ly goblins. But we saw this vast chamber ahead of us and off we went. There was scarce anybody in this chamber – neither beast nor orc. On the plus side, it is a clean trail what the dwarfs could use for safer passage, I think. On the bad side, by the time we were able to get back to where we wanted to be, we had passed a long stretch likely full of orcs what are still blocking the trail along the way. There was some disputing and discussing out on the trail as to whether we should backtrack right away and try to clear out the orcs along the trail or proceed forward to Orc-Watch. Ultimately, it was decided that it was getting late and a backtrack would leave us with a particularly long day of adventure. So, we went on ahead to Orc-Watch in its stead with a promise to come back and finish what we started. There were a couple more smaller Orc camps between where we were and Orc-Watch. On one of them we rescued what must have been near to 30 dwarfs what were being prepared for supper. Orc-Watch, as it turns out, is not near so accommodating at the Twenty-First Hall. I am back to sleeping on grain sacks again. Which is still better than sleeping on hardened stone. The do have a hefty invention here called an “elevator”. You step into it and . . . well, there’s some mechanical contraption involved that may involve one of them water wheels we saw at the Water Works – what lowers you in a cage near to 100 feet to a hallway below. Iffen you step back in, the dwarfs will do some things with levers and such, and up you go, riding to the top-most part 100 feet up. I have ridden it a half-dozen times at least just for the fun of it. Anyways, our next patrol was to be in the Redhorn Lodes, but we’re going to have to put that aside for a bit. We need to backtrack our steps and see iffen we can find that trail that we were to clear of orcs. Sagla went out on a scouting expedition while the rest of us were settling in for bed, taking one of the Dwarf goats for a quick patrol. That will help us. As mentioned, we are going to be continuing our patrols at Zelem Melek – making sure to finish that region up properly before going on to explore the Redhorn Lodes. I am torn between two options. Option 1: The current plan - explore the Redhorn Lodes, increasing the level cap to 55 so that we can enter the Grand Stairs and begin the quests and deeds associated with this instance (the entrance to which is located in the Redhorn Lodes). 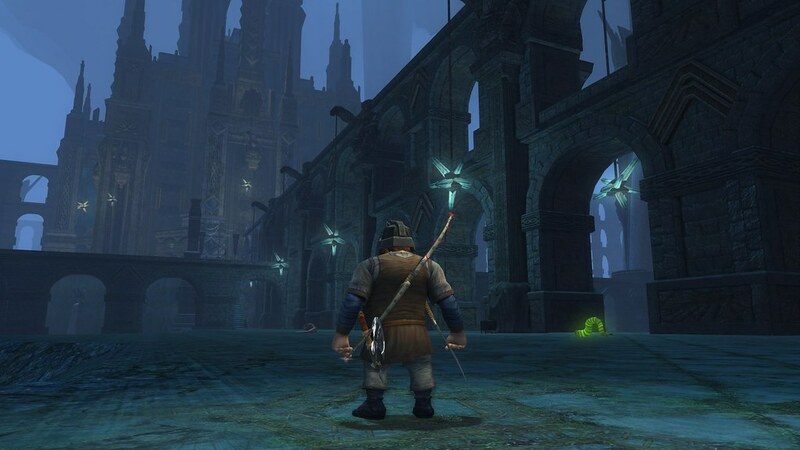 Option 2: The alternative plans - explore the Redhorn Lodes at Level 51 - then go to the Flaming Deeps and explore them at level 53 (it is a Level 57 area) - then return to the Grand Stairs at Level 55. We are helping to push the orcs out of Moria, but things have gotten a bit more difficult. The orcs are putting up even more resistance. So as you can imagine what we are up to, there is this large Dwarf establishment called the 21st Hall where they have set up stores and supplies. It appears to be in the heart of Moria as I understand it. Expeditions depart from here to deeper parts of Moria where the battles against the orcs are going on. One such outpost is called, appropriately enough, Orc-Watch. It looks down upon a vast cavern what is filled with tracks and dust what comes from the mining that goes on down there. 'Cept the current miners are orcs and not dwarfs. It seems as there are two tribes of orcs what are battling down there. There's the Moria orcs - the orcs what have lived in these mines for an age or two and made it their home. And there is an invading tribe of orcs what use a symbol of a White Hand, so they are called White Hand orcs. These new comers are bigger, stronger, and appear to have better and brighter leaders than the Moria orcs, what are a disorganized mob for the most part. The fact that these two tribes are battling each other suits us just fine. We intend to go down amongst them and deal a blow to both of their houses. Though there's a fear that this might unite them against a common threat. Hopefully, we can weaken them too much for that to be a bother. Besides, orcs aren't disposed to using reason with much effect and, if only one tribe recognizes the danger we pose, that will not be enough to establish peace. That would take intelligence in both tribes. So, we feel safe. Now, after the dwarfs established this Orc-Watch outpost, some of the orcs - I think they are Moria orcs - closed in behind them and blocked the supply routes. There were near a half-dozen Orc camps built near the pathway that allowed the dwarfs to travel from the Twenty-First Hall to Orc-Watch. Some of the supply caravans had been captured and one of the orc tribes had no small number of dwarf prisoners. Anyways, our first task was to clear those travel routes and to make sure that dwarfs and supplies could reach Orc-Watch once again. So, we formed up an army with an intent to push our way through the Orcs and clear out the region known as Zelem-Melek and make sure that the orcs were no longer a bother. I went with Tubli, Medloth, Thorlily, Granleif, Fraori, Bohalin, Wandrin. I do not recall seeing Tubli about recently though . . . I do confess . . . all dwarfs look a bit alike. And, it is fitting, for clearing out Moria, that we contain no small number of dwarfs. Tubli, Granleif, Fraori, Bohalin, and Wandrin are all dwarfs. Thorlily was new to us. I'm not sure why she showed up but there is a hint she was invited along by Thorcundo. Well, we did find the dwarfs what needed rescuing and, as it turned out, it was just as they were being prepared for supper - and not in a way that one would consider hospitable. After a bit of a rest we were still awake and recognized we had time to do more accomplishing, so we ventured off into the Redhorn Lodes to do battle with the orcs down there. Indeed, some of these orcs are stronger than those we are accustomed to battling, but nothing that we could not handle easily enough. They were widely scattered and did not make much of a force. We paid no never-mind as to which tribe any particular orc belonged to. We just swept through and made sure that there were fewer orcs after we passed through than there were when we started. After all that work, I am afraid that I am going to need to head on back to the Twenty-First Hall. We collected a number of valuables from the orcs and such, so I have a shipment that I need to send off to Mr. Sweetweed. You should be expecting his payment in the next few days. With the supply routes opened up, I am not expecting to meet more than an occasional scout or such along the way - and I am hoping to get back before our next patrol. I will write again then I am able. In discussion, people indicated a stronger preference - after completing the Redhorn Lodes - to go to the Flaming Deeps at Level 53 for the Landscape quests there, rather than going into the Grand Stairs at Level 55. One potential advantage to this is that there is a chance that the Standing Stone folks will have the Moria instances fit for group play by the time we enter the Grand Stairs. I am still expecting Tier II and Tier III modifications much like those established in The Rift for the Level 50 level cap. From now until Feb. 11 we will be patrolling the Redhorn Lodes at Level 51. We'll be advancing the quests as we go. For any who may have gotten a bit behind, note that the Redhorn Lode quest chain starts fresh so behindness does not matter. Feb. 12: Raise the level cap to 53. This is a Tuesday. The Flaming Deeps quests are Level 57, meaning that we will need to be at least Level 52 to pick up those quests. Feb. 12 - Mar. 11: I am expecting that it will take about a month to go through the Flaming Deeps landscape quests - which we will do at Level 53. Mar. 12 (Very tentative): Raise the level cap to 55. Mar. 12 - Early April: We will camp at the Grand Stairs (much as we did at the Forgotten Treasury) and make frequent attacks into the caverns in order to clear out the massively large number of orcs living in them chambers. In the same way that we treated the Forgotten Treasury as a number of vaults (20 in all), we will treat the Grand Stairs as a vast Orcan infestation that will require multiple expeditions to drive the orcs out of every corner. Early April: Early to mid April: Declare the orc tribes in the Grand Stairs to be neutralized, and return to the Flaming Deeps and camp outside of the doors to the Forges of Khazad-dum and Fil Gashan instances. We will stay here as we work our way through these two instances. June?? We may try wandering over to the Water Works to battle squids and turtles. Last edited by Tiempko; Jan 22 2019 at 12:25 PM. we have made it to the Water-works and they are truely spectacular. A grand monument to the ingenuity, craftsmanship and resilience of the dwarves of old. Never have I seen a place more marvellous and awe-inspiring. A gigantic cavern, supported by massive beams of stone. 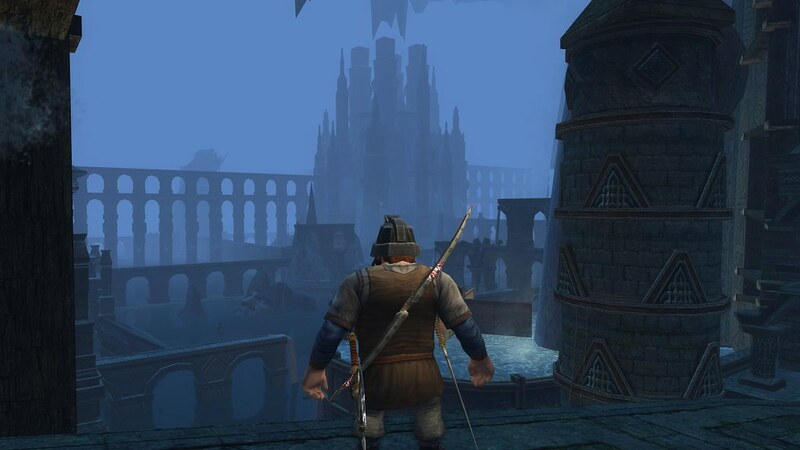 There are towers which collect water and snow from the top of the mountains and then send it down here, where it falls upon equally massive aqueducts that serve as bridges, across which the water is then funneled to various parts of Khazad-dûm. The aqueducts themselves are nicely adorned with enormous dwarf statues holding blue, glowing crystals on chains which serve as light. The water not only serves as drinking water and cools the hot forges and furnaces, it also falls onto giant wheels and makes them spin and thus powers some great machinery. I don't know what exactly that machinery does, as most of it must lie within colossal, palace-like structures of which at least four have been built here, one of them right in the center. Maybe they serve as giant forges, for they also have chimneys. But now they lie dormant, the doors locked. I would really like to look inside one of them! Actually, there was one small dwarven camp in one, but the passage leading further inside was blocked by a rockfall and an iron grate. Some of the aqueducts are broken and the water falls down to the ground, where it leaves great puddles, some as big as a lake, before it seeps away to even deeper places. Everything is wet and slippery here, the moist air is filled with the sound of rushing and dripping water and the whole place is bathed in an eerie, bluish mist. The Iron Garrison has also established an outpost here, a place which they call the "Rotting Cellar", ha! Most of them that were sent here are engineers and they are as resourceful as the dwarves of old were. They make use of what they can find and we helped them gather legs of those glowing spiders they would use for lamps that had gone out long ago, or acid from the glow-worms which they then used to craft a solution to get rid of lichen and fungus. They are hard at work and still learning how to get the place in order again. See, in the middle of the rotten cellar lies a gigantic, bent water wheel and a couple of them stood around it, scratching their heads and wondering how to repair it and get it back out, ha! The place was also teeming with the strangest Wildlife, as we discovered when we went down to the main floor, past old living quarters with beautifully stained glass windows. There are toads as big as sheep, and lizards, small and big, and the white spiders, and turtles like the ones we had seen in that sulphur lake in Angmar. Even the odd goblin was scurrying around. One dwarf here had studied the wildlife and determined that if we kill enough toads, this will disrupt the food chain in a way that the other animals are also weakened. So we spent quite some time toad hunting. The biggest threat however was the strange fungus that is spreading throughout the deeper parts of Moria and we found one side-chamber where the fungus was really abundant and some had grown quite big, with piles of rotten flesh and bones around them. As if it feeds on living prey! And in that chamber there were more infested orcs, horribly deformed. They were mad from pain and obviously suffering, screaming their "insides are burning". We made sure to put them out of their misery and burned the fungus piles. We are still not sure how they get infected, which is highly unsettling. Did they eat it? Were they forced to do so by some evil wizard? I am much more afraid of this fungus than of any orc we have or will encounter. I am afraid that one of the mushrooms will pop open and spray it spores all over me and then I will turn into mushroom food, consumed from the inside. And some of the dwarves said they have also eaten mushrooms, with rhubarb. We picked some and had them looked at, and luckily those seemed to be fine. The dwarves think it is spreading through the water and it may not be safe to drink it, so we brought some water samples, but I am not sure what came from it. Maybe I don't want to know. One dwarf thinks he could create a solvent from the acid-glands of the glow-worms to get rid of it, so we collected and brought him some and his potion did indeed remove the fungus from a mirror and some wheel blades it had attached to, at least it seemed to work to some degree. He is my new hero! But I think more investigation where the fungus comes from and how to fight it is needed. We also helped one dwarf to repair a giant water-wheel, foreman Indrith. This wheel seemed to be of particular importance, and the expedition had sent him out to get it working again. We found him, alone, inside the wheel-house. Outside were a lot of infected orcs, and the fungus stuck to blades and paddles. We cleaned everything with the lotion. Inside were a lot of toads and small lizards and the foreman thinks they get pulled by the current into the pipes and clog them up. So we went deep inside to the tunnels through which a strong current of water rushed and cleaned everything up there aswell. Had to be careful to not slip and get swept away by the stream. We were soaking wet when we got back, wheel still didn't work as the main gear was sheared, so we went to a place where the foredwarf had seen an intact one and brought that back to him. Then, the big wheel started to turn and Indrith was happy. He also told us he heard a great noise the other day, as if something big was moving through the Water-works. A big creature. He had overheard some orcs talking, and they were afraid of tentacles pulling them into the water. We immediately thought about the monster we had battled outside. Not far off is a big basin, or pool, in which the water is collected before it is sent to this wheel, and maybe it made its lair there. We walked over to the entrance, and its line of statues, big orange and green crystals and a huge door lined with statues looked pretty impressive and as if this was an important place. Some dwarves had already set up another small camp here. One of them, Kaldi, mentioned that when he neared the entrance and opened the door, he heard a great thrashing in the water within. Something big was in there, something alive. He had also found some ooze in the water nearby, which might be the creature's blood. He didn't go inside and we warned him to not do so, at least not alone and not yet. We think we are finally closing in on the monster and it is good to at least know where it is. We were done here anyway and decided to go back to the Twenty-first Hall to report our findings to Brogur and Bosi. Let's see what they think about the lake-monster and what should be done. Last edited by Craiden; Jan 27 2019 at 12:51 PM. Excellent job, Erikin! I have often wanted to let folks see a Club Éclair adventure. Iffen readers want context, Erikin took that video as we had just finished up the Water Works. All of our adventure was done and we were making our way to the Rotting Cellar to report in and say our farewells. With our Water Works adventures behind us, it was a good time to take a last look around and say our farewells to the place. My earlier statements that there were no real threats in Moria and no need for an army were premature. Just a couple of days ago I walked from Orc-Watch back to the 21st Hall to reprovision. I was running short of foods. This is the route that we Eclairians had just patrolled - driving the orcs out of their camps and securing the route so as the dwarfs can get supplies from their main camp at the 21st Hall to distant places like Orc-Watch. I thought the way would certainly be safe. Well, I was on my way back to Orc-Watch after stocking up on Lambas breads and other provisions when I came upon an orc on patrol. Now, there's still lone orcs about on patrol that we encounter from time to time, so this was not so unusual. I would say that he certainly looked a bit larger and stronger than most, but we have been battling orcs for years. Besides, he was all alone - a decision I thought he should be made to regret. Gad was I wrong! He charged after me and, with a swing of his club landing a firm blow on my shield, sent me flying through the air. I crashed down to the ground and he was on me again. He had me flying off into one of the deep caverns that are common in Moria and it was all I could do to grab onto the lip of a small wall to stop from dropping to my doom. But here he came to throw me off. I was bruised and battered and certain that something was broken. I could tell I was in a fight for my life. I retreated away from the abyss so as he would not toss me over. Then I used my trusted Dwarfen club - the one they gave me when we were about to fight that monster at the gates of Moria - which I have come handle quite well in the passing years and serves me well - and proceeded to do battle. I pulled out every trick I knew to keep my spirits up and not giving in to defeat and despair, but it was not easy. I had to constantly remind myself never to give up. Eventually, I gave the orc a few solid cracks and he ran off. But the whole thing goes to show you that Moria isn't safe just yet. A few folks suggested he was an Orcan general looking for his lost army which we had battled when we cleared the route. Well, iffen he's an Orcan general, I am wondering what he is thinking of losing a battle to a poor alone hobbit and former Clerk to the Mayor of Michel Delving. Something tells me that I am going to be mentioned as some type of Dunedain Ranger or a whole squad of berserk dwarfs defending their homelands by the time the story of our fight ends up around the Orcan campfires. More can be said of the Redhorn Lodes, where there are two tribes of orcs locked in combat. One of the tribes is those what had lived in Moria for so many years since they kicked the dwarfs out. The other are these White Hand orcs battling on the surface and what are as much a threat to the Shire as they are to the orcs and dwarfs of Moria. I dreamed once that these Moria orcs and dwarves united against this White Hand threat but, truth be told, that seems unlikely. The regular soldiers have some battling skills, to be certain, but they have some leaders among them that are a certain menace. If not for the fact that we had a good crew with us, any single one of us might have fallen to them. We have actually had . . . oh . . . a half-dozen patrols or so since we cleared the way to Orc Watch. We drove the workers and regular soldiers away without much difficulty. We destroyed their mining equipments as best we could and hunted down their leaders. One of the White Hand commanders had built a command post down a cul-de-sac. We could see him in the distance, but I could not see a way to reach him. Erikin saw a route, though, and lead us along the path. His choice of a cul-de-sac for his command center proved a poor idea for, with us coming down the one street, he was trapped and, in a short battle, eliminated. I think we are near to being done driving the orcs out of the Redhorn Lodes. Fraori, Alphred, Granleif, and others are preparing for one last sweep of the mines to track down and drive off any stragglers among the orcs. They're sharpening their weapons and getting their armours put on as I write this and will be going out shortly. We do try to work in shifts like this so that the orcs get little time to rest. Amio is still missing. We had the dwarfs send some search parties out among the Water Works where he was last seen, but there's naught a sign of him. I have begged the dwarfs to keep searching. I do hope he will show up. Iffen you see him back at the Shire on account of him getting tired of adventures, please let me know so as I will not worry. Anyways, clearing the orcs out of the Redhorn Lodes is not the last of our troubles. There's a dwarf named Knakk what has set up an outpost high on a platform deep in the Redhorn Lodes. He's summoned us over so as we can help him scout the areas just beyond. I suspect that these are areas where no Dwarf has yet been, so no way to telling what we may find there. Except spiders. Knakk mentioned spiders. Knakk has a small little camp, not a fit place for near to a dozen Eclairians, so we're back at Orc Watch. We'll be loading our packs with provisions and such and heading out to see where he wants after we get a decent rest. I will let you know what we find. I will let you know what we find. Feb. 2, 4: The Knakk quest chain looks like a lot of back-and-forth to an area of fungus and spiders. But, it is a short walk and we should be able to make our way through it by the end of the session - with enough time left over to walk to Auti's camp for the following week. Feb. 9, 11: Adventuring out of Auti's camp. Like the Knakk adventures, this involves some back-and-forth, but it is a short distance and we should be able to finish it in a session. Auti will direct us to the Flaming Deeps. Feb. 12: Level cap goes up to 53. The quests in the Flaming Deeps are Level 57, so folks will need to be Level 52 by the time we get there (Feb. 16) to pick up the quests. Feb. 16, 18: March to the outpost of Anazârmekhem in the Flaming Deeps. We have two routes to take. One route is direct and free of enemies. The other route is long and indirect and filled with villains and unexplored territories. Level cap increase to 55 on March 12. Upon finishing the Flaming deeps . . . we will get a vector quest to Nud-Melek and, from there, out to Lothlorien. We will need to ignore that. It will bypass a great deal of Moria content. Instead, if we march back to Orc-Watch, we will discover about 15 new quests waiting for us. These are Level 58 quests that will send us into the Grand Stairs. We will pick up the quests at Orc-Watch, and then continue on our way to the Grand Stairs. WARNING: Recent discoveries suggest that, even though these quests are Level 58, they may be locked behind a Level 60 starter quest. Consequently, we may need to reach Level 55 before entering the Grand Stairs. If this turns out to be the case, we may need some filler activity from March 12 until folks have reached Level 55 . . . skirmish trainings, a return to The Rift Tier II, or the likes. I will send Alphred out to scout the terrain once we reach Level 53. Last edited by Tiempko; Jan 31 2019 at 12:17 PM. I am most saddened to hear the news of Curmie’s passing. He was a mighty find dwarf, and quite a friend of the Shire and the Bounders. Give my deepest sympathies and condolences to his friends among the Warders of the Weald. I do hope he would be pleased at our progress in Moria. 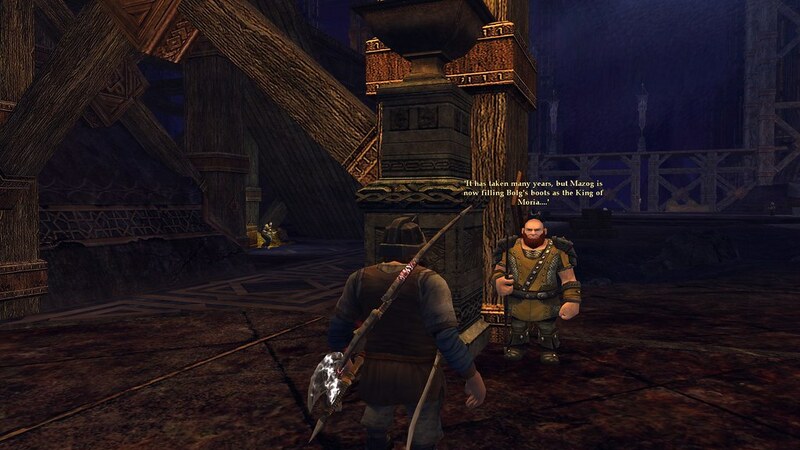 We are continuing to help the dwarfs here to claim the Redhorn Lodes. We finished a whole set of skirmishes against the two tribes of orc living here. There’s the Moria orcs what have lived here for an age, and the Whitehand orcs What are bigger, stronger, better lead, and better equipped. But there are other menaces to deal with. Out of the east, there are spiders and orcs seeping up from the deeps of Moria - covered in the same type of fungus what was infesting the Water Works. It weren’t no natural infestation. It turns out that there was a gardener. It was an odd creature with strange backwards knees and an odd shaped head - a bit larger than an orc and a bit more villainous. I do not even know what to call these things. Well, at the direction of a dwarf named Knakk, we slayed the gardener. Well, Sagla had it slayed quite handily. The rest of us were concerned with burning back the mushrooms. Roy, and Fraori went out on expeditions and used their rock wizardry to burn back whole sections. Thorfaniel used her natural wizardry as well. We did not pursue the infection far into the deeps as we don’t know how deep it goes. Besides, it has overcome tribes of Moria orcs and colonies of spiders as well. I am getting concerned about what I am hearing about the deeps of Moria. It seems as the dwarfs have not been forthcoming about the great numbers of orcs living down there. In our explorations, we came to a place where a lass named Eniel who had set up a campsite and was standing guard. Inside a tunnel, at the other side of a drawbridge what keeps the orcs from invading. There are countless orcs down there, we are now being told. Any proper attempt to battle them will require an army. We are leaving them orcs on the other side of that draw bridge. Instead, we are driving the infestations out of the final corners of the Redhorn Lodes. We are expanding the realm of the dwarfs one region at a time. But getting into them deep regions seem most problematic. Well, there’s another region west of here between the Redhorn Lodes and the Water Works to clean. That’s called the Flaming Deeps - and properly so. We took a peek when we were in the Water Works it were so full of hot steam that we could scarce see. It was a miserable hot place, but the heat is a part of what powers Moria for the dwarfs. I did finally meet a dwarf what knows how to adventure. Auto set himself up a tent with a proper bed and table and kegs of ale. As soon as we got there, most of our party took to the ale with such abandon what it rendered the rest of the day useless for adventure. So we are resting until folks recover properly. Then we are going to finish up shooing the vermin out of the Redhorn Lodes. Again, give my condolences to the Warders for their most saddest loss. I will be thinking of them and wishing them well. Feb. 9, 11: We will go ahead and muster at Orc-Watch since it is easier to get to, then wander to Audi’s camp to help with bug disinfecting. We should finish with Auti’s quests by the end. Note: Folks should get to the top of 51 and be near to 52. On the following week, folks will need to be 52nd Level to get the quests. Feb. 12: Level cap increase to 53 (54). Feb. 16, 18: Muster at Auti’s Camp and head the back route to the Flaming Deeps. The quest requires this. There will be some battling along the way and a quest to finish to help folks get to Level 52 (which will be required for seeing the next quests). We will continue on to Anazarmekhem which should become our next home for a few weeks. When I get a character to Level 53, I will see if we can start the Moria quest chain at that level. It's Level 58 quests but, as I mentioned earlier, it may be locked behind a Level 60 gate (requiring that we be Level 55 to start). If we need to be Level 55 to get that first quest, the next level cap increase may come sooner rather than later. I took Hedgerow to Level 53 so that I could see if the Grand Stairs quests are available at that level. They are Level 58 quests, so I have been assuming we could get them. Option 1: Return to the 21st Hall, pick up the Epic Story, and follow that and the Nud-melek quest chain to Lothlorien. (1) It is the next region consistent with our level. (1) That quest chain ends up sending us outside to Lothlorien - bypassing much of what is still in Moria (though the elves will send us back). (2) We will be putting off fellowship instances for several months. (1) We are in the area and it would make sense to enter these regions at this time. (2) We get to do fellowship instances sooner rather than later. (1) It disrupts the story. There are about 15 Level 58 quests to pick up before entering the Grand Stairs and they tell the story of why we are going there and what we are being asked to do. Option 3: Finish the Flaming Deeps, raise the level cap to 55, adventure (skirmish, revisit The Rift or Helegrod, until everybody gets to 55), then go to Orc-Watch. (1) We will be jumping levels and levelling pretty quickly. (1) We finish up the Flaming Deeps and we return to the 21st Hall for some rest, relaxation, and reprovision. (2) While at the 21st Hall, we raise the level cap to 55 and then engage in skirmish and story telling until we get everybody up to Level 55. (3) Once everybody is at Level 55, pick up Narfi's quest (which is at the 21st Hall anyways) . . . sending us to Orc-Watch and the Grand Stairs. 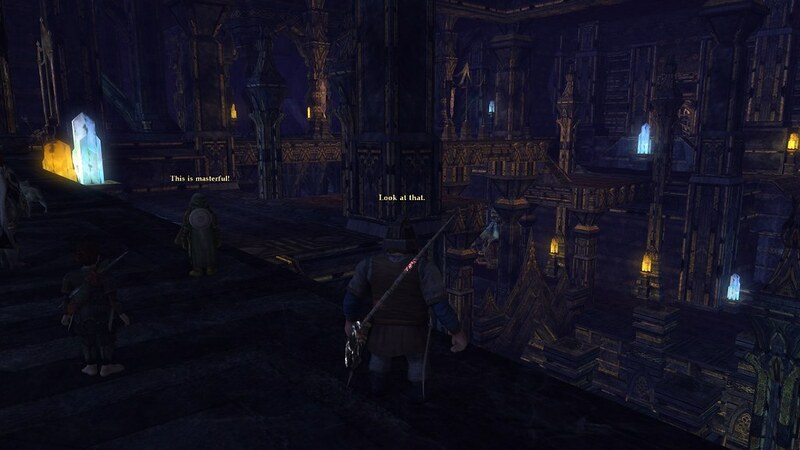 (4) Muster at Orc-Watch and head over to the Grand Stairs (fellowship instance). (5) Battle in the Grand Stairs (completing quests and deeds). (6) Return to the Flaming Deeps to battle the Orcs in the Forges of Khazad-dum (fellowship instance). (7) In the Flaming Deeps, battle the Orcs in Fil Gashan (fellowship instance). (10) Return to the 21st Hall and pick up the Epic Story. (11) Follow the Epic Story and the Nud-Melek quest chains both (at the same time) out the east gate and to Lothlorien. NOTE: The elves of Lothlorien will send us back into Moria where we will continue with the Foundations of Stone and the remaining three Moria class instances. After going through the Grand Stairs - return to the Flaming Deeps for the Forges of Khazad Dum and Fil Gashan instance. Last edited by Tiempko; Feb 11 2019 at 11:43 AM. I too favour option 3, but with one modification. Raise the level cap to 55 immediately so all the experience we gain in the Flaming Deeps count towards it. Yes, this will mean that parts of the Flaming Deeps will be easier than it would have been otherwise, but better that than having to jump through a bunch of hoops just to level up. Skirmishes, raids, etc. are inefficient ways of leveling. Doing quests at around your own level is the quickest way to gain levels, so wasting half the xp we could gain in the Flaming Deeps, only to immediately afterwards try to earn those xp in less efficient ways seem like a bad idea to me. Besides, it is not like we will outlevel the quests in the Flaming Deeps anyway. We will still be underlevel, just not as much underlevel as we usually are. Aye, this was in the back of my mind. I agree that those who are leveling more slowly should not be hindered in reaching 55. On the other hand, them who level quickly (e.g., me) should be slowed down so that they do not get 3 levels beyond the rest. So, I was considering keeping the cap at 53 until the slowest of the regular folks leave Level 52 behind. The fast levelers should not have any difficulty making up any lost quest XP. It's the slower folks that I don't want to hinder. If the slower folks would let me know when they are in the top half of Level 53, I'll use that as a guide for the next increase. Note: At Level 52, we opened up two new repeatable solo legendary items quests at Dolven View (The Morroval-outcasts and The Ghost-forge), and a new repeatable small fellowship legendary item quest at Echad Dunann in Eregion (The Siege of Barad Morlas). The Morroval quest is good for helping folks finish up their deed for slaying bat-folk in Moria. I vote for the Modified Option #3. Taking the stone off in the Flaming Deeps and heading towards level 55 makes most sense. Well, with the twice-modified option. The level cap will be 53 until the slower folks get near the top. I hope I do not say anything too embarrassing as I write this. I am somewhat indisposed. I have been surrounded by dwarfs who have been drinking in celebration of the life of one of their passing . . . a dwarf named of Kafli. We found his body among the orc-infested region north of here, still clutching the locket given to him by his sweetheart to whom he became betrothed shortly before starting on this adventure. Apparently, it was his most prized possession and he died in its defense. Well, these dwarfs are well provisioned and there have been several rounds of ale in celebration of his life. We are not fit for any further adventuring for the moment, and it may take more than a day or two until we are fit enough to risk battle. There’s a half-dozen dwarfs here, including four of our own, some of whom are trying to prove that they are able to hold more ale than any of the others. I don’t think that it is fair that the bear-lady Medloth participates in the contest. Something of such mass can certainly absorb a lot of ale. Hopefully, no creature like that which Sagla and her crew ran into is lurking nearby. It was a cave claw, but a monstrous type unlike any we had seen before. Roy had said earlier that he had run into such a beast. It was so massive and tough that he had no chance against it. We had come across some big creatures in here, but naught what we could not easily handle. I thought something had merely caught Roy off guard. Yet, from what I hear of what Sagla and her crew met with - and Roy was with her - it were nothing a lone Eclairian would have a chance against. Indeed, the five of them that were on patrol at the time battled it for a good long time to finally get it defeated. That was five against one. Fortunately, it did not surprise them and they had time to get themselfs set for a fight before charging in. When we recover from our drinking, we will be heading down a long bug-infested tunnel looking for some heat source that is incubating the bugs that are infesting the long tunnel we will be heading down. Some among us left before the celebrations started . . . Sagla, Thorfaniel, Roy, and the like . . . and have already written back telling of a camp down that way where they will be staying, inviting us to follow after them when we are able. Like I said, that might be a couple of days. They’ve written back saying that the region is occupied by fire orcs and fire lizards, so we should be ready for them when we get there. I was also sad to hear that one of our company . . . Liatri . . . a lass what has accompanied us since our first days at Michel Delving and seemed particularly protective of Hedgerow . . . has left us to return to the Shire. The sadness is all mine and I am happy for her. She said she had been away so long she had forgotten what Shire life was like, and would be spending some time among the green fields and rolling hills of the Shire. I was grateful that she stopped by and said her farewells. Too often when folks leave they just up and vanish and we never know what happened to them. We simply have to hope and trust that they are well and happy wherever they may have gone. She will be missed, but there’s no begrudging that there’s only so much volunteering a folk can stand. That leaves just Roy, Hedgerow, and me from what started out in Michel Delving . . . what? Over six years ago now? Oh, but I had heard from another Eclairian what had been missing for a bit. Jaytull showed up recently and said that he was getting himself prepared to return to the battles that lay before us. At the same time, Medloth mentioned talking to a squad of folks what might be joining us in the near future. This were a squad of 6 or 8 folks or some such what had heard of our army and thought that they would come to assist us in our battles. According to Medloth, they went to get themselves equipped and provisioned proper for battling and that we should not expect them right off, but soon enough. They may be coming at a good time. What we have learned is that there are layers of Moria below them what we have visited, and they may be packed full of orcs, goblins, and other villains in great numbers. There was mentioned of a Grand Stairs north of here what connects these various regions, but the orcs are trapped on the far side of a draw bridge that prevents them from charging out and attacking. There’s been mention of a want to muster an army to tackle these strongholds – and we may be enlisted. It would be good to have reinforcements iffen that should come to pass. Granleif has sure been urging for it. I have seen him talking quite emphatically with the dwarfs urging them to make the decision that we should be entering these strongholds. There was recent talk of yet another delay in those battles, and I could feel his scowl without even looking at him. I suspect that he’s going to get his wish. I am of the suspicion that once the Flaming Deeps has been tamed and cleared of villains and vermin that the dwarfs will announce it is time to deal seriously with the hordes of orcs laying in the deeper deeps of Moria. So, there’s been a lot of news recently. But I am safe and all is as well as can be. I will write to you again and let you know what the dwarfs have planned. The current level cap is 53. The current level cap will remain at 53 until the slower regular folks among us get near to 54. At that time we will raise the level cap again, but I wish to avoid having huge spreads in our levels. The fast folks can wait at the top of 53 for the slower folks to catch up before moving on. Note: At Level 52, three resource instances, 2 solo LI instances at Dolven View, and 1 small-fellowship LI instance at Echad Dunann in Eregion become available. At Level 55, 2 more solo LI instances at Dolven View and 1 more small-fellowship LI instance at Echad Dunann will become available. The Level 57 Solo instance at Dolven View, "Morroval-outcasts," is useful for advancing the Morroval slayer deed. The Level 60 solo instance "The Spider-Nest" is useful for advancing the spider slayer deed. As things seem now . . .
We will spend the next 4 weeks or so adventuring about the Flaming Deeps. March 16, 18: We should spend a session at the Twenty-First Hall. There, we will pick up Narfi’s instructions. We may also be able to pick up a couple of additional repeatable quests relevant to the Grand Stairs. These appear randomly at the 21st Hall. (We should avoid the epic story quests until we can fit them in.) We may use this opportunity to muster some small fellowships for the small-fellowship LI instances mentioned above (or, at least, “hear stories of what happened there” - *wink* *nudge*). Think of the scenes in all of them adventure movies where the heroes get themselves equipped and geared up for the climactic battles to come. Folks can get their new Level 55 gear equipped, collect provisions, scrolls, tokens, potions, and the various equipment for battles, and be ready for the climactic clashes to come. March 23, 25: We will muster at Orc-Watch and pick up the quests there. It has about 15 quests and, those who like to read quests in detail (and I recommend it) may want to do this before the muster as it will take some time (and has some useful information). We will muster and head off for our first battle in the Grand Stairs. The month of April: Our base will be the campsite in front of the Grand Stairs – near Knakk’s campsite - as we make repeated assaults on the Grand Stairs (to complete the quests, slayer deeds, and the "challenge mode"). NOTE: Once we reach 55, we will be at that level for a long time (finishing up Moria and Lothlorian as well) – so please put extra effort in avoiding Level 56. On unrelated matters . . . folks interested in the doings of Club Éclair can talk to us or overhear our OOC chattering on the user channel club-eclair. (/joinchannel club-eclair) We use "say" and "emote" mostly for the roleplay. We are, after all, a role-playing group so our adventures are walk-and-talk and in-character. This is one of our two hard-and-fast rules. The other hard-and-fast rule is the level cap (currently 53). This is important for keeping everybody at the same level. Last edited by Tiempko; Feb 13 2019 at 10:38 AM. ((Club Eclair II)) HOT! HOT! HOT! Gad, these dwarfs come up with the awfullest names. We are at a place called “Anazârmekhem”. I am just going to call it Flaming Deeps Station. This place is hot. Hotter than hot. It is an oven. It is hotter than an oven. And it smells like rotten eggs. There are no proper beds and all of the food tastes bad - on account of the smell getting into the taste of everything. And the dwarfs never stop chattering long enough for a hobbit to get some sleep. Over at the long table there’s more than a half-dozen dwarfs chattering about big war plans. They don’t involve us, and they say little to nothing when we are within earshot. But, I see them looking in our direction as they chat among themselves. There's no mystery among us that iffen the dwarfs decide to send patrols into the underdeeps to visit the orc nation what lives below us that they'll be sending us while they work on claiming this here topmost part of Moria. Actually, "topmost" isn't entirely right as we have travelled through three parts of Moria - an uppermost part and a middle part and a lower part. We are in the lower part now - the part nearer the heart of the mountain with its flaming deeps and watery wetness not far away. It is more to the point that the orcs live in regions beyond this central core that we can't reach - north and south, east and west. There are several ways to reach those other regions from this lowest level of Moria. It is just a matter of deciding who to send and when. The hotness is particularly harsh iffen one dresses up proper for the battling of orcs, as that requires thick and heavy wears so as to stop arrows, swords, and fangs. By the time we get back from our patrols, I am naught but a puddle of hobbit sweat. I find myself drinking tub fulls of water when we are done. And salt! I always thought the dwarfs were rather unimaginative in their putting rock salts on everything they eat but a day in the heat and, for some reason, salty foods taste particularly good. For our part, we are rescuing dwarfs out of the Flaming Deeps. Seems some patrols went out just before a large gaggle of orcs showed up, cutting them off. Here’s an interesting part: these orcs seem particularly bred for heat and flame. They are particularly well suited for it at any rate. We have taken over the patrols while the dwarfs discuss their war plans. They prob'ly smell bad, too . . . only, I can't tell since the very air smells bad. Another dwarf what had gone off by himself found himself slayed. We came across the body on our way here from the Redhorn Lodes. Fortunately, the other dwarfs seem to be learning. They were out and about in groups of three. That was enough to deal with what threats the orcs threw at them. We found Feggi and his company what had retreated into a room where there was no escape - at least none that we saw - dwarf doors are invisible when closed, or so I hear. Orc bodies were stacked at the doorway like cord wood and they were fine, though a bit winded. We found anther company in a hidden corner near another orc camp. They were doing more watching than battling. They sent us in to battle the orc tribe while they headed off for deeper parts of the Flaming Deeps. I think it is their intention that we follow them, but we had been rescuing dwarfs for quite some time and needed some rest before we continued on our patrols. Back at the Flaming Deeps Station a dwarf gave out an alarm upon seeing a "monstrous, massive cave bear" coming across the bridge to the camp. By the time he got anybody else's attention, we saw one of our patrols coming across the bridge - one with Alphred, Fraori, Granleif, and Medloth. It were Medloth the bear lady that the dwarf saw. Yet, when Medloth entered the camp and were confronted by the dwarf what swears that he saw a bear, Medloth answered with, "Bear? What bear?" We are all considering what we can do to get ourselves prepared for them battles. We are improving our trainings and getting our equipments in order and getting properly provisioned. We'll be quite ready for the orcs when their time comes. The Monday group was able to catch up to the Saturday group - so everybody is back in synch again. Our current base is Flaming Deeps Station (aka Anazârmekhem) in the Flaming Deeps. Feb. 23, 25: Muster at Flaming Deeps Station (aka Anazârmekhem) to march to the Crossroads of Ash. There may be detours along the way for those who need to catch things up. We will not be rushing things. March 2, 4: Muster at the Crossroads of Ash for exploring the western part of the Flaming Deeps. March 5: Raise the level cap to 55. March 9, 11: Finish up in the Flaming Deeps. There will be a goat vectoring us to Nud-Melek, but we will be ignoring that for purposes of taking on the Moria instances next, and visiting Nud-Melek when we return to the Epic Story. March 16, 18: Spend the day getting ourselves equipped and prepped for the Grand Stairs - preparing food, gathering quests, and seeing that stragglers make it to 55th level. Folks who have reached Level 55 can get suited up in their Level 55 gear. March 23, 25: Muster at Orc Watch. Pick up the 15 quests waiting for us there. (Please do this in advance if you like to read them - as I do - and it is highly recommended that you do so as they are relevant to the story.) Then, we will march into the Grand Stairs. Our first adventure will just be some preliminary exploring and battling. (I do not expect to finish the instance before we retire.) Moria opens on the Legendary Servers in March, so . . . we will see what this brings . . . if anything. March 30, April 1: Muster at the Grand Stairs mustering camp and prepare to explore the whole of the Grand Stairs from start to end. April 6, 8: Return to the Grand Stairs for another day of battling. April 13, 15: Attempt the Grand Stairs challenge. During our time at the Grand Stairs, completionists are encouraged to arrange opportunities to finish up their slayer quotas. The Warg quotas, I think, are the most burdensome, but small fellowships should be able to enter for the sole purpose of hunting down and slaying a few wargs. I think. We will see how mean the instance villains actually are when we get there. Last edited by Tiempko; Feb 20 2019 at 02:13 PM. I've been out due to PC issues, but should be back on tomorrow night... anything I need to be caught up to the Monday group? See you soon! Let me see . . . catching you up. We've finished up everything we can find in the Redhorn Lodes. That place has been relatively tamed and, so, we moved on into the Flaming Deeps. There, we spent some days working out of this Dwarf outpost with a long funny name what starts with an A and that no hobbit can pronounce. I just call it the Flaming Deeps Outpost. We've completed the quests assigned out of there up to the point where we are being sent to the Crossroads of Ash. That is what we will be doing when we muster on Monday. We will gather at that . . . um . . . Flaming Deeps outpost with the unpronouncable name, pack our gear, muster up, and set out to marching over to the Crossroads of Ash. I am about to head out on another patrol to a place called the Crossroads of Ash. It is far on the other side of an orc-infested territory called the Flaming Deeps and, being orc infested, I cannot guarantee that it will be easy to get a post out to you. So, I am writing this and sending it out before we leave just in case. Iffen you do not hear from me for a couple of weeks, you will know why and you will know not to worry. The Flaming Deeps has not proved particularly dangerous. We’ve been patrolling quite regularly without any great difficulties. Indeed, Roy and I have gone on a few patrols. There’s a dwarf here name of Myndil who will pay us handsomely for going into the Flaming Deeps and finding some rare trace metals among the orcs. It seems that the orcs are using this metal as a type of currency. Of course, it does no harm to be ridding the area of Orc patrols in the process. That isn’t to say that there are no real dangers what pop up from time to time. Sagla and her squad invaded an Orcan encampment a few days ago. In it, they found a few leaderly types which were a bit more difficult to battle than most orcs. But they were on their way out when they discovered that a most highly skilled battle orc had closed off their exit. I have been told that this orc was not of a likes that a lone Eclairian could have easily defeated alone. By description, it seems much like the orc that ambushed Hedgerow when he went back to the Twenty-First Hall for provisions. By his telling, the battle against the leader orc lasted a good long time and, by the end, he had used up all of his reserves and was struggling to hold on. Normal folk, I would think, would have embellished their story, but that seems something Hedgerow would not even think of. Anyways, he did survive. Fortunately, Sagla had her whole squad with her, the orc was doomed at the start. Galdhron, Bohunc, Erikin, and Roy all helped. Hedgerow was there, too. So, they were able to defeat the monstrous orc and return safely. Actually, Bohunc might have missed it. I recall that he came back early on a recent patrol on account of having some other work to do, so it might have just been the four adventurers plus Hedgerow. Either way, it tells the virtues of not adventuring alone. We’ve discovered more than a small number of dwarfs what have met an untimely end when they wandered off by themselfs in search of mithril or some other treasure. Our own numbers, or so I hear, are about to be augmented. There’s been stories circulating for a few weeks now of a squad what has volunteered to help. The dwarfs have been directing them to our group as reinforcements. We Eclairians are taking this as more proof that the dwarfs are about to send us into the deepest and darkest parts of Moria – places where the orcs (and other fell beasts) live in greater numbers and are much more powerful than the weaker orcs they drive out and into the lands we patrol. They’re all tall folk, as I understand it. I do worry that they will find our ways not to their liking and leave. There are grumblings among some that we are a bit too slow and methodical in our ways – and that is not suitable for some. But it’s suitable for those who are out to explore and adventure and who are not into simply running into battle for the sake of battle itself. Not that there’s anything wrong with that. Different folks have different ways, and there’s naught room for complaint as long as they aren’t hurtful of others what don’t deserve it. Well, anyways, they’ll be arriving just before the patrol goes out, as I understand it. They are on their way here via goat as I write this – or so I have been told. I will let you know how things go once we have a proper gathering. As I said, it appears that we are being prepared to be sent into the darks of Moria against the larger numbers of more powerful orcs. When we finish helping the dwarfs gain control of the Flaming Deeps, we have already been told that we should report back to the Twenty-First Hall and speak to a dwarf named of Narfi. Iffen he judges that we are acceptable by his standards – he does not want to send us out just to get slaughtered, or so I have been told – then he will give us instructions. The first missions will be into a place they call the Grand Stairs. The orcs there are on the other side of a draw bridge. Iffen he judges us suitable, he will tell us how to drop that draw bridge and get to the orcs on the other side. Oh, and one other thing. I have just been told while we were about that the dwarfs have been fixing up the place. It were put to us cryptically when we got a message saying, “some landscape adjustments have been made to Moria”. I am anxious to see how the dwarfs might have fixed up the place while we have been out and about patrolling the lands. Anyway, that’s all I have to say for now. It is good to know that you and the girls are safe. I haven’t heard of any serious troubles west of the Misty Mountains since we came into this place. I hope the good works we did out there hold. Hullo and welcome to five new folks what showed up for the Monday patrol. No doubt you had your imaginings as to how things would be when you caught up with us . . . and I hope that you found no undue disappointments when the imaginary became the actualary. Here is where I keep folks informed about what we are doing so that they can be prepared. Feb. 26 through March 4: We will be patrolling about the Crossroads of Ash. I suspect there may be some patrols organized on off days (e.g., Sunday, 10:00 is a common time) to head out to hunt lizards – given that there are lizard quotas ((our IC term for slayer deeds)) to work on. Folks are advised to spend their time getting their characters to the topmost portion of Level 53 without going over – as the level cap is 53. March 5, the level cap will go up to 55. Mostly for the sake of new folks - adventuring isn't limited to the group times indicated. Any time two or more folks want to get together and adventure, they should consider themselves invited, encouraged, welcomed, and prodded to do so. My characters will head out on a few lizard-slaying patrols in the weeks ahead. Any time 2 or more folks want to go on some skirmish training, siege training ((IC term for epic battles)), slayer deeds, or to visit some past area you did not finish property - then that is just fine. Just check into the channel and if somebody else is about just give out a shout. "Hey, would you be interested in a patrol of the Flaming Deeps//going on a skirmish or siege training//telling stories about some past exploits ((our IC way of talking about returning to some region we had been at previously to finish up deeds or quests)). And if there is . . . for example . . . three or four folks who would like to start meeting at . . . for example . . . Thursdays at 2:00 PM . . . then that's fine as well. Last edited by Tiempko; Feb 26 2019 at 10:19 AM. Warning: Clocks start moving this weekend. It will not impact the Saturday mustering, but the Monday mustering will be starting 1 hour earlier for folks who are not Americans living in states with stupid time shifting laws. I am back at the Twenty-First Hall . . . and I am trapped. The dwarfs are confining everybody to their quarters until they do a full inventory of all of their equipment and supplies. Since this includes everything in the vaults and all of the stores they have in the crafting area, they expect that this will take the whole day. While they do their counting, they don't want folks moving things about. They want everything and everybody to stay put. Except for the dwarfs who are actually doing the counting, of course. They can move about. Indeed, a dwarf just came by moments ago saying that the inventory is taking longer than expected and we should just go to bed and get some sleep. They were kind enough to bring me a 24 ounce steak with smashed taters and a thick mushroom gravy for supper. So, I have naught else to do but to sit here by the fire and work on my maps. I figured that this will be a good time to write up a report and send it in. Though, I am told that I cannot even post this until the inventory is done. I tried getting to the post and a dwarf with a spear near to skewered me until I was back in my hole. The reason we are here at the 21st Hall is because the dwarfs have called us here to train and provision so that they can send us into the deepest darks of Moria, where dense packs of the stoutest orcs and their minions live. One of these such places is a place called the Grand Stairs. This is what connects the parts of Moria that we have been helping the dwarfs move into from them parts that the orcs and other fell beasts control. Rumor has it that the latter is much larger with much more orcs and fell beasts than there are dwarfs. I don't recall mentioning . . . there's a draw bridge between us and the orcs of the Grand Stairs. It's what keeps the orcs from charging out and overrunning the place. The dwarfs are going to tell me how to lower it so that we can charge out onto the stairs and battle the orcs that are encamped there. I suspect that the last time you heard from me, we were still at the Flaming Deeps. We have helped the dwarfs take that place back, at least as well as we could. Ultimately, we decided that there were too many orcs for us to fully conquer, so the dwarfs sent Fraori in on a secret mission to destroy a particularly good forge what the orcs had been using to make special weapons. Him being a dwarf and all, he knew more about dwarf stuff than most of us. He didn't say much when he got back, but he reported that the deed was done. I suspect that he was saddened about having to put a fine forge to ruin like that, rather than take it back from the orcs. Well, with that, the orcs have little reason to stay about and the area there has been mostly tamed. That is when we got word that we're being called back to the Twenty-First Hall to train and provision. I had a nice walk here . . . I had good company. Galdhron went with me as far as Dolven View. I had heard that the dwarfs of Dolven View had found a couple of smaller forges and, since they liked my mappery, they were waneting to send me out to find them. They specifically insisted that they would send only me and the rest of the Eclairians would have to stay behind, as they did not want the whole world to know the details of these forges. So, I figured that while folks were making their way back to the Twenty-First Hall, it would be a good time for me to take a quick detour and see these dwarfs. I was able to take Galdhron along a route that only a proper mappist could have been aware of. It was a safe route. It started off going down a deep and narrow canyon. The orcs above could have killed us iffen they had thrown stuff down from high above, but it seems they could not even see that far - and it is quite far down from the top where the orcs live. From there we went through a corner of the Redhorn Lodes and then the Way of the Smiths. This is that place with the new grand forge that Thorcundo helped them discover long ago. I guess with this forge it is a lot less painful losing the littler one in the Flaming Deeps. Then we came out in a mining shaft in the Silvertine Lodes, climbed out, and finished the walk to Dolven View. Well, I helped the dwarfs with finding and mapping their mines. It turns out the job weren't so easy as the dwarfs caused me to believe. It weren't a matter of just finding some old forge and putting it on the map. One of them was infested with bat-folk, and another had ghosts of all colors - red, green, blue - and was overseen by a weaker version of them red robes what caused us so much trouble back in the Trollshaws and elsewhere. So it was a bit of a trouble getting everything measured out correctly and drawed in proportion. But I did what they set me out to do. If that weren't enough for my day, I decided to head north and see about the construction of some statue. All about Moria, we'd been finding pieces what got scattered about by the orcs and have been shipping them up to the Chamber of the Crossroads. It weren't but a short walk from Dolven View and I had mapped a route that was more direct than most. It were a nicely built statue and I was pleased to see that we had done something to repair some of the damage to this place. And there I cam upon Thornlily. She's a hobbit. We met before . . . she travelled with us once or twice on a couple of our patrols. I really don't know why she is out and about so far from home with her bow and such, but she's good company. She went with me all of the way from the Chamber of the Crossroads to the 21st Hall. That route is about 3 times longer than it needed to be on account of its windingness. On the way, we stopped by a library what is the only thing of note along the Winding Way and I checked out a new wing what had just been opened. It were filled with batfolk so I rescued some of what I thought were the most interesting of the books and headed back out. And then here I am. Fortunately, I was able to get some of my chores done 'fore they locked me in the Chamber of Leadership and ordered me not to move until they got their inventory done. So, I do have some provisions. I noticed I was running low on some other things so I rushed off a post to Mr. Sweetweed for proper Shire foods and such things as he keeps in his warehouse. In the meanwhile I sent back a few crates of special items - particularly ores - what I picked up about Moria and what he uses in his factories and shops. Others are on their way. Sagla got here before me, and I heard Thorcundo rumbling about. He said he was a bit behind in some things and was rushing about getting them done. A couple of them newer folk were getting themselves trained. I have not had a chance to enter my own trainings yet but, with me being caught in this room until the inventory is done I will certainly not get anything finished today. But, we have a couple of weeks before we think we will be set to enter the Grand Stairs . . . so there is time. I will let you know what we find when we get there. P.S. In case you're wondering why you haven't gotten this yet . . . it's been three days now and the dwarfs are STILL doing inventory. Seems their numbers weren't adding up so as they are double-checking all their work. I am beginning to fear we won't be trained up proper in time for our planned excursions into the deepest darks of Moria. Since them dwarfs haven't finished their inventory yet and they're cutting into our opportunities to train to go into the deepest darks of Moria, we are putting off those adventures until we have had more of a chance to train appropriately. March 9 to March 25. Story wise, we are spending this time at the 21st Hall getting ourselves trained up and equipped to go into the Grand Stairs. Folks should work on reaching Level 55 and picking up a quest from Narfi at the 21st Hall called "Quest:Enemies of Lothlórien". That will start us on a quest chain that will take us through the first 3 of the Moria class instances; Grand Stairs, Forges of Khazad Dum, and Fil Gashan. March 26-March 29: There is no official game sessions in this period (though, because of my personal no-teleportation rule I will be doing some actual walking in this time period). For the sake of story continuity, this is the time we spend going from the 21st Hall to Orc Watch. Folks are encouraged to check in at Orc Watch and to get the quests read. There are 15 of them and they will take some time to read if we were to do it in the session. March 30, April 1: Muster at the bottom camp of Orc Watch, march over to the Grand Stairs, and enter for our first excursion. By my calculations, we should not need any gatekeepers. We will stay at the Grand Stairs until we consider it to be the case that we have done a proper good job defeating these orcs, then we will move to the Forges of Khazad Dum instance in the Flaming Deeps. Just a note for new folks. (1) No teleportation. I will use rapid travel to mimic the sending of a message, but when it comes to doing things my feet stay firmly on the ground and I walk from one place to the next. (2) First-person. If you see my character looking left or right it is because I have to look left and right to see what is there. (3) Radars off. I see what I see and nothing more. This has resulted in a few surprises as I get jumped by villains I never saw. (4) Always have a food bonus. When I have no food bonus, I am hungry. When I am hungry, I eat. I am a hobbit - what do you expect? (5) Only found equipment. There is no box store of magical items where one can enter and pick up a magical sword off of the magical sword rack. So, if I find a magic ring, it is because it was laying in a troll hord or some ex-hobbit might have dropped it in the bottom of a cave, or somebody gave it to me as a reward for good deeds. But that's just me. Personal rules are not required of everybody, but there is a general request of politeness to respect the rules of others, even if it means that their characters are less than optimal. Addendum: I have been lied to. I was told (or, more precisely, I read) that we would be able to walk into the Moria instances at 54th Level without a gatekeeper . . . but experiments show that this is not the case. Thorfaniel tested this and reported back that our level is too low. So . . . we will be using a gatekeeper. Last edited by Tiempko; Mar 11 2019 at 09:45 AM. I am sorry for getting this to you a little late. I hope it did not cause you to worry. We are back at the Twenty-First Hall preparing for some battles in the deepest darks of Moria. I have been busy training and getting my equipment in top shape, as well as collecting provisions. Training has been the most important. 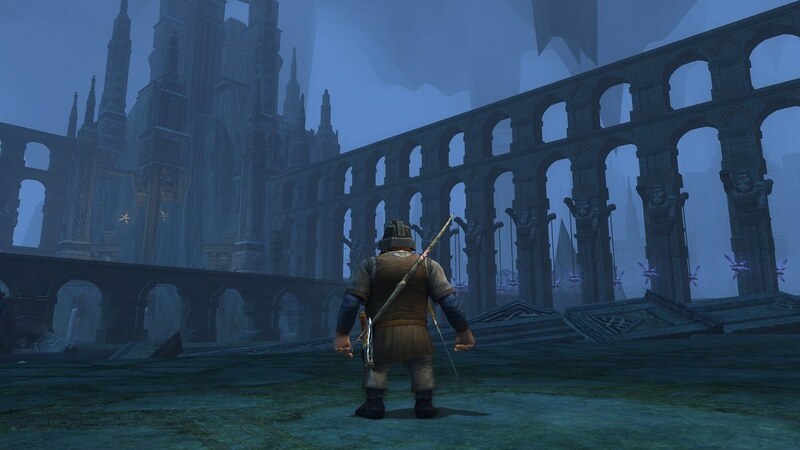 I have made several excursions of my own into some of the darker corners of Moria, working on my battling skills. I have also gone on a number of skirmish trainings. Plus, there are some old forges on the fringes of the area that the dwarfs control that give one an opportunity to gain some battle experience. I am confident that I am ready for the challenge. It is not so obvious that we are ready - speaking of Eclairians as a group. We haven’t battled any particularly strong foes in a while. Other than some effort we put in clearing the orcs out of them 20 vaults in the Forgotten Treasury, our last big battle was against the creatures what occupied the Forgotten Treasury. They weren’t too troublesome, so long as we had at least four of us in the battle. So, we are a bit rusty. Plus, we have a gaggle of new folks - almost entirely tall folks, except they got a hobbit with them. I am going to have to learn his story sometime. He’s a quality warrior, however. I have been pushing him to the front, since he seems quite able to stand toe to toe with the villains. Well, the addition of new folks means we have to learn about each other. For that end, we have been going out on training missions together. We are definitely rough about the edges, but each training session brings improvement. That is why we train. We'll be fine, I trust. Oh, we did have one piece of unfortunate news. Hedgerow told us that the dwarfs were going to give us keys to the doors that keep the orcs trapped in the deepest darks of Moria. However, he was mistaken. The dwarfs report that they never promised us keys. All we have is Hedgerow’s assertion that it was promised. Thorfaniel went off and confirmed that the dwarfs will not be giving us keys. It seems certain. Whatever the facts of the matter were, instead of giving us the keys, the dwarfs have dispatched a gate keeper to the Grand Stairs. Surprisingly, the gatekeeper is a hobbit - and a Bounder at that. Even more surprisingly, he’s Mr. Sweetweed’s oldest nephew Ayrhawk. Apparently, he has an affinity for dwarfs and has come here to offer his assistance, he learned to smith metals from the dwarfs in Needlehole the North Farthing and has been a frequent visitor to Thorin’s Hall before coming here. He is well known to and well respected by the dwarfs. He was our gatekeeper at the Forgotten Treasury, and seems a competent - though somewhat stern and dour - hobbit. In spite of his skill with a bow, he will not be coming with us on account of having “more important things to do”. There's even rumours about the Bounders in the Shire that he's grown a beard, but I've seen him and can put that rumour to rest. That is all I have to report from here. Two more weeks of training, then off to the Grand Stairs where Ayrhawk awaits. I still need to get my equipments in order. I'll write again 'fore we're off. I promise. For the next two weeks, we are at the 21st hall training up to Level 55. There is no reason to risk bumping up to 56. We will be at 55 for a long time and we will get warnings when that is about to change. So, I'm pocketing my turtle rock as soon as I reach 55. Later on, as time progresses, I'll be migrating in the direction of 56, but not before Lothlorien at the earliest. There’s a pair of dwarfs near the 21st Hall stables that hand out different (random) instance quests. These change from day to day so, if you pick up some quests one day, there may be different quests available the next. I have been picking them up as I go by. There are two for each instance (12 quests in all), and they are repeatable. Also, for Level 55 folks, there’s two Level 60 solo instances at Dolven View. Reminder: One has spiders, for those who want to advance their spider slaying deed. Another has bat-folk. Last edited by Tiempko; Mar 15 2019 at 02:53 PM.